Since the territorial days of 1870's, Jewish people have played an important role in the social, economic and cultural life of South Dakota. In the 1880's, Sioux Falls experienced an influx of Reformed Jews from Germany, who became some of the city's leading merchants and entrepreneurs. In 1903, the Mt. Zion Cemetery Society was formed by the Reformed Jews. On October 5, 1910, it was announced in a Sioux Falls newspaper that another group, the Orthodox Jews, had engaged in meetings that resulted in the first steps taken toward the acquisition of a Synagogue. Finally, in October of 1916, a merger of the two groups was achieved and the Congregation Sons of Israel was created and chartered. A church building, formerly the United Evangelical Church, located at 320 North Minnesota Avenue, was purchased. 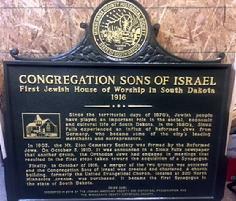 It became the first Synagogue in the state of South Dakota.